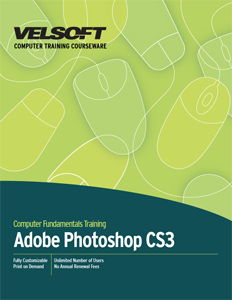 This training courseware title provides everything you need to professionally deliver Adobe Photoshop CS3 - Advanced training including editable training manual, hands-on exercises, exercise files, detailed instructor guide, classroom-ready PowerPoint slides, and unlimited online learning licensing. Seeing is Believing This sample manual to teach Adobe Photoshop CS3 - Advanced is in MS Word format. Just like you would find in any advanced level training material, you'll notice that the level of training in Trainingmaterial.com's Adobe PhotoShop CS3 is complex. PhotoShop can be an easy piece of software for anyone to learn, but the advanced features aren't so easy. Using proven & professionally written materials to instruct others is the best way for others to learn. And since the courseware is already done for you, there's no need for you to develop your own material. This can be time-intensive and costly endeavor. Why waste time and money when it' already done for you? We invite you to click below and download a free sample of Trainingmaterial.com's courseware. See how Trainingmaterial.com's courseware and Adobe PhotoShop CS3 work perfectly together.